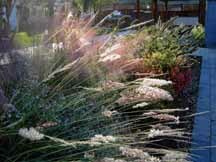 The appreciation of color, light and form is a fundamental aspect of enjoying plants in the garden. It happens to also be the basis of enjoying the glass art of Dale Chihuly, so his current exhibit at the New York Botanical Garden is the perfect reason to visit this world-class destination to explore and enjoy the interaction of people, plants and art on a spectacular scale. Large-scale art in a grand setting is beyond the scope of most of us for our own gardens. But the take-home lessons can often be applied at a more personal level. In any case, it is a pleasure to behold the collaboration of keen-eyed artists doing what they do. So kudos, not only to the Chihuly team, but to the talented gardeners behind the scenes at the NYBG. The beautifully detailed settings and plant choices interact with the glass compositions in both quiet and spectacular ways, adding immeasurably to the experience of the exhibit and the garden. The first time I saw one of Chihuly’s Reeds on Logs compositions, it was in a well-lit indoor gallery space, where the logs seemed a little out of place. The Red Reeds On Logs installation, in the current exhibit, is set in a shallow pool at a major garden cross-roads and the color and shape contrast spectacularly with the huge swaths of grass all around. The mature pines in the park-like setting make the logs feel at home and the glorious red lines get the attention all to themselves. Inspiration for Chihuly’s Float Boat goes back to works he created in Finland in 1995. He has done variations on this theme ever since, but he created the installation at this exhibit to honor the NYBG Native Garden . In this garden setting the colorful glass orbs take on a more botanical reference to me. The graceful boat-shape almost looks like a slender seed-pod, over flowing with ripe fruit or colorful seed. One of my favorite installations is set inside the large Victorian-era glass conservatory. This makes the composition a work of glass inside a work of glass. But an important factor for this and some of the other pieces inside the New York City landmark was simply the smaller scale and the ability to observe closely the attention to color and detail. It is an especially masterful example of a composition that offers a different perspective from different angles. From the “front” as you enter the NE wing of the conservatory, you are greeted by the wavy-bowled shapes of Chihuly’s “Macchia Forest” suspended on iron bases within a lily pond. Your eye is struck by the pure hues of blue and orange, inside the glass forms, allowing the shapes to visually “pop” against the verdant backdrop and create a beautiful example of the power of contrast. The “side” view of this installation masterfully uses analogous color to great effect. From this perspective you notice the organically mottled glass pattern that repeats the gold and orangey-red of the tropical vine dripping with blossoms from the arch overhead. More greens and golds repeat the reflections on the water’s surface and the colors of the lily pads floating in the water below. The “backside” of the composition features glass “macchia” with pure black outsides, which, in their absence of color (or really the presence of all color, as we know from theory), highlights the wavy-edged forms that makes you suddenly notice the wavy-edged fountain in the middle of the pool. The traditional tiered iron fountain, which features the Three Graces, is now an important part of the composition from this view-point. The light reflecting off the undulating black glass forms feels like additional reflections of light off water. The whole composition, from this side, is now strikingly detailed by the crisp blue edges of the black-backed bowls and the soft-blue racemes of the tropical Jade Vine hanging down from above. The cool luminous-blue of the other-worldly blossoms, look almost like water droplets , a lovely final flourish that highlights both form and light. The crazy curls of the large-scale Sol de Citron, which stands like a flowery sentinel at the Palm Dome entrance to the Enid A. Haupt Conservatory is spectacular. Beautiful from afar but equally lovely up close where you can admire the detail of the individual tendrils and enjoy the patterns of light and shadow on the surrounding surface. Inside the conservatory, Chihuly’s Fiori installation highlights compositions of reeds, flowers and leaf-like forms. Here the enjoyment is the interplay with living plants that repeat the shapes or highlight the stark colors of the glass pieces. Chihuly doesn’t try to imitate specific plants or flowers, but the fluidity of the glass medium naturally creates forms that look like they “could” be alive. The interplay of light and shadow, shape and color make for many breathtaking moments in the Fiori exhibit. Playing with perspective of distant objects is useful composition tool for any garden. In a setting as large as the NYBG, playing with perspective is easy to do. The white-tipped Sapphire Star is a beautiful installation, featured in an open area where it can be viewed from a distance. It is one of the many pieces that is illuminated at night for a whole different perspective on color and light. In the day it appears to anchor a spot of the open sky above. Against the open green background and the expanse of corn-flower-blue sky, Sapphire Star holds its own as a focal point. Reminiscent of a thistle or ice crystal or a blue-seeded dandelion, each viewer will have her own take on the beauty of this spectacular piece. Color coordinating your outfit is not required but certainly appreciated. Joy plays with perspective and Chihuly’s Sapphire Star at the New York Botanical Garden.